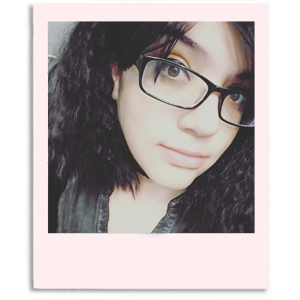 Hey guys, how's it going? I'm being a little polish zombie again today. It seems no matter how much sleep I get I still always feel tired. Like about to pass out on my desk. I have quite a few things to post up throughout today so get pumped. Ohh Yeahhh (imagine the Kool-Aid man saying it). I actually gave you guys a preview of this the other day on Instagram, if you're following me you probably saw it. 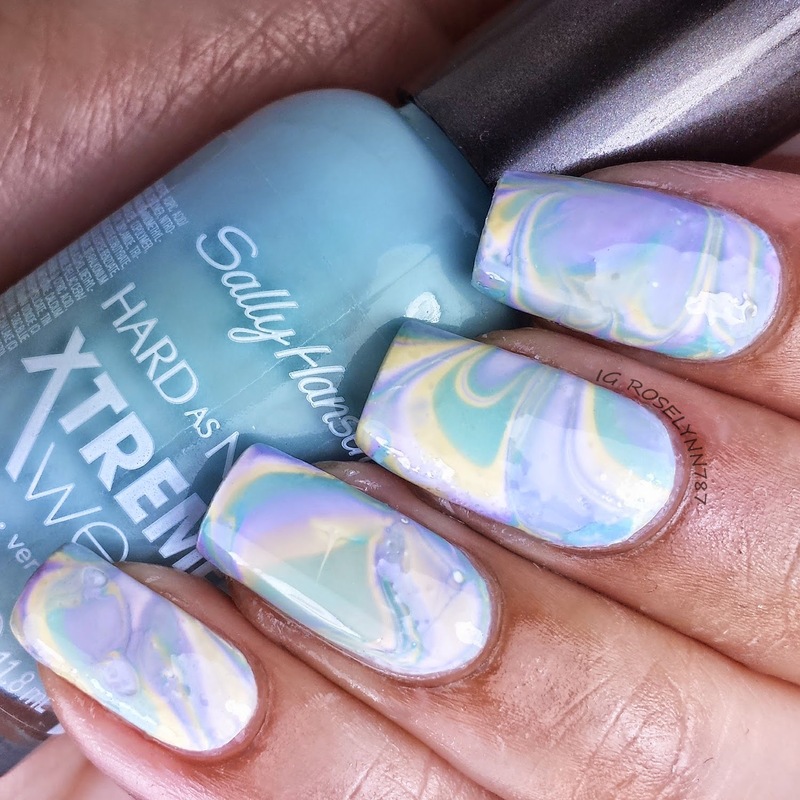 It's my watermarble attempt using Sally Hansen's Xtreme Wear Electric Summer polishes. I actually did individual swatches and a review on half of the collection the other day, you can read that here. I don't think it came out too bad or rough. I'm still quite the novice when it comes to watermarbling but I do try to at least get one in a month. Practice makes perfect after all. I do apologize for the way my skin looks in the following photo, I didn't remove all the cuticle oil before taking the shot. Watermarbling can be quite messy and requires a lot of clean up. That's a lot of acetone, so I usually drench my cuticles and skin with oil before and after cleanup. Polishes used are all from the Xtreme Wear line by Sally Hansen. For this marble, I rotated the four colors about 3 times so that they could all be visible. There are so many tutorials on this technique that I didn't feel there was a need to make one. Especially because like I mentioned, I'm really new at this. Once I have some more practice though I'll be sure to share my tips and tricks. If you have some tips for me I'd love to hear'em. I need all the help I can get! 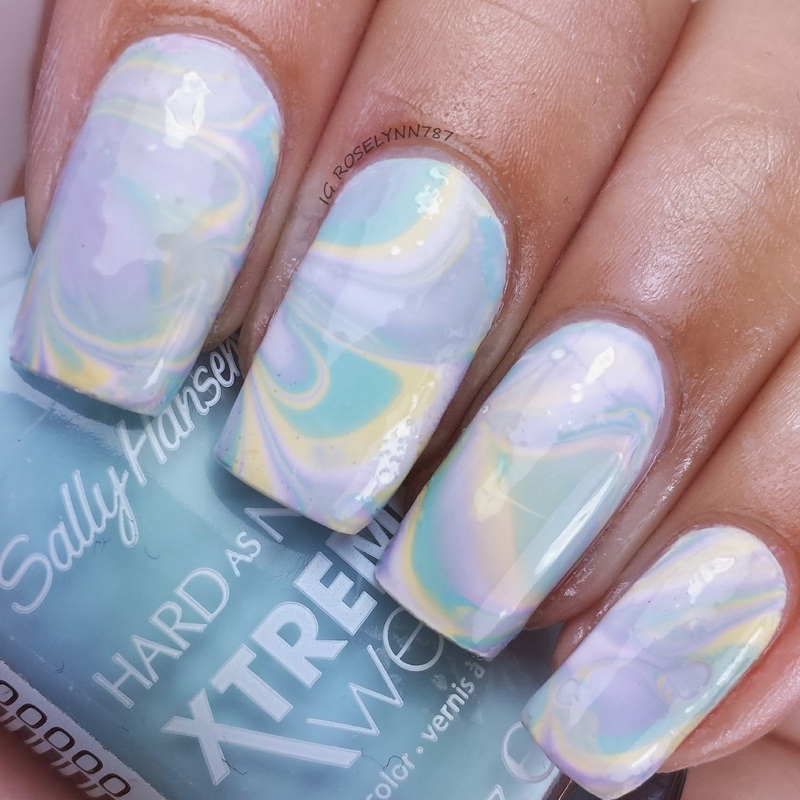 How do you guys feel about watermarbling? Love it? Hate it? Let me know down in the comments. I know I don't always reply but I do love reading what you guys have to say. This marble is amazing *___* I should definitely try a pastel marble myself, I'm deeply in love with the subtle effect <3 great outcome! I love it, but all the tutorials I've come across make it seem so hard. Not too sure if I can tackle it.